4.Factory price,your profit can be maximized. 5.ICAO,CE/Rohs,CA Hunan Chendong Technology Co., Ltd., located in Lugu International Industrial Park, the historic city of Changsha, Hunan, China, is a high technology enterprise engaged in the research, production, sales and after sales services of all kinds of lamps with a wide range including aviation obstruction light, green light for airport navigation, mining lamp, mining exploration and measurement instrument and optical testing equipment. These products of aviation obstruction lights and airport green navigational aids are in line with Military airport clearance regulations issued by the State Council and the Central Military Commission; Civil Aviation Law issued by the People's Republic of China; appendix XIV of International standards and construction methods for airport, airfield technical standards (MH5001), and aviation obstruction lights (MH/T6012) issued by International Civil Aviation Organization. They are newly developed via extensive collaboration between indoor experienced R&D personnel and several academic institutes as well as advanced technologies imported from foreign countries and are widely applied in military and civil aviation, airport clearance, helipad, tower, chimney, harbor, bridge, high building, etc. The basic safe series of electrical measurement devices are especially designed for application for medium-sized mines to make up any error done by conventional measurement. 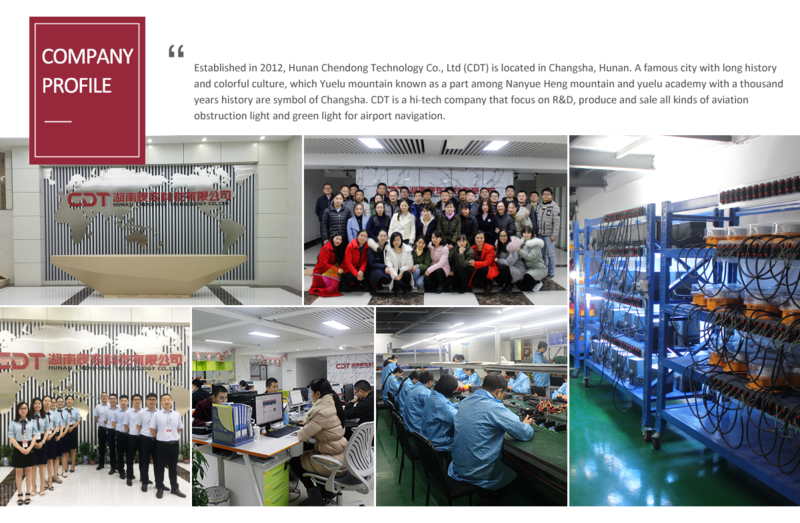 Chendong has been adhering to the operation principle of "being innovative and realistic, honest and trustworthy", and the management objective of "continuous improvement of product quality, and meeting customers' desire" to achieve ISO9001 certification with an advanced quality system. Chendong will provide you with the best products with the most reasonable price and perfect services and meet customers' requirements in the way you always wish.